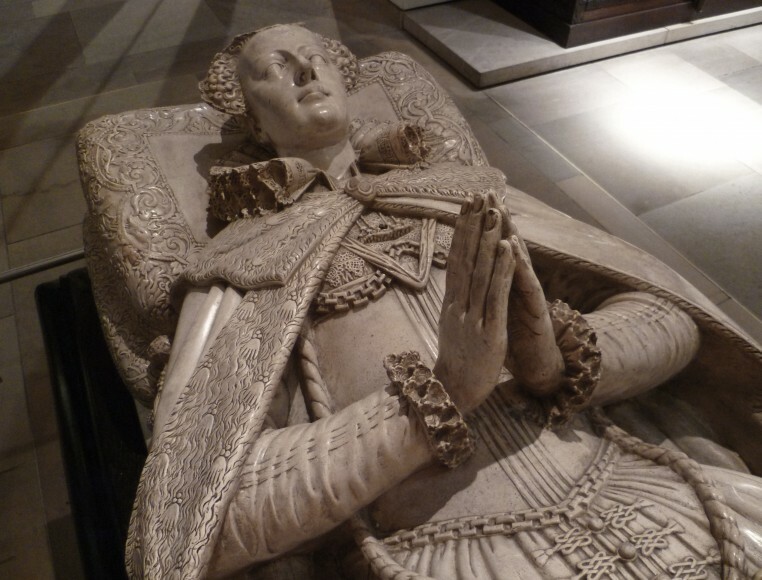 One of the best known figures in Scotland’s history is also Linlithgow’s most famous daughter. Mary Stuart (originally Stewart) better known as Mary, Queen of Scots. Her extremely eventful life (and death) have been immortalised on the big screen in several Hollywood movies, television series and books. That amazing story all started in our very own Linlithgow Palace. Following the death of the his first wife Queen Madeleine, King James V of Scotland sent Cardinal Bethune to Paris. This was to find him a new French bride. His chosen spouse was Marie of Guise. In June 1538 in St. Andrews, the wedding ceremony of James and Marie took place. Cardinal Bethune crowned Marie as Queen of Scotland. Their first son, James, Duke of Rothesay, was born on 22 May 1539, followed by Arthur, Duke of Albany, on 27 April 1541. Tragically both died within a few days/weeks respectively. On 8 December 1542, Marie gave birth to their daughter Mary. 6 days later, James V died on 14 December 1542 aged only 30. Did you know? King James V (Mary’s father) was also born in Linlithgow Palace on 10 April 1512. 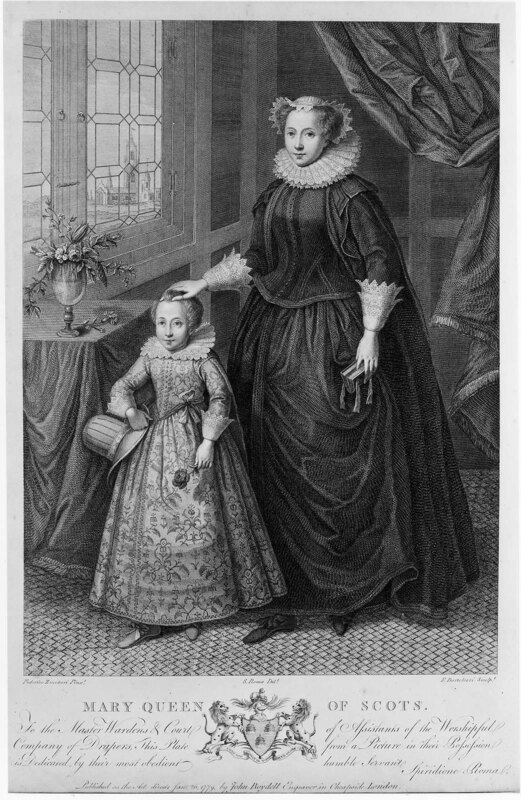 Aged just nine months Mary was crowned Queen of Scots. 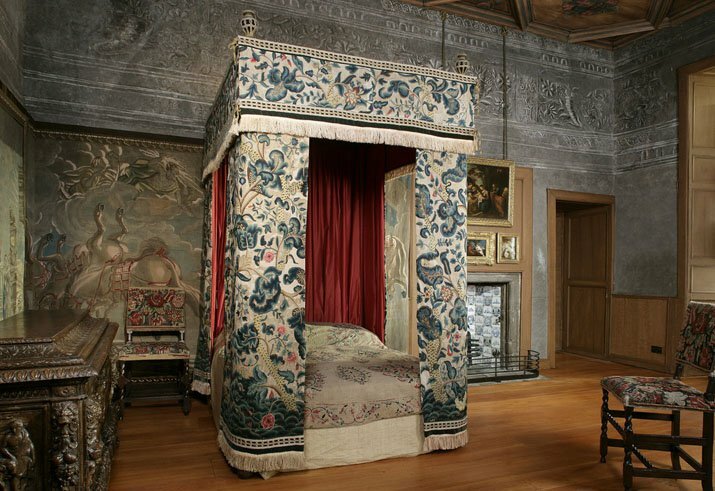 The ceremony was conducted in September 1543 in the Chapel Royal of Stirling Castle. In 1548, at the age of five, Mary set out for France, leaving her mother behind to ‘look after’ Scotland. Marie and her government had agreed to marry Mary to the eldest son of King Henry II of France. The alliance was a natural next step, cementing the old friendship between the two countries, and isolating their natural enemy, England. England hoped to take advantage of the situation by force. Knowing Scotland was vulnerable with a child on the throne. They wanted a marriage of Mary to their own child King, Edward VI – son of Henry VIII and Jane Seymour. Mary, spent the year prior to leaving for France, moving about the Scottish countryside. She was hidden in remote locations in the hopes of keeping her physically safe following the Battle of Pinkie Cleugh. Betrothed to the Dauphin of France, Francois II she therefore spent her next 10 years in France. She learned philosophy and poetry, drawing and needlework, several languages (French, Latin, Greek, Italian, and Spanish) and enjoyed falconry and hunting at the various French Chateaux. Francois and Mary were formally betrothed on April 19, 1558 in the great hall of the Louvre in Paris. On 24 April 1558, at age just 15 she married the Dauphin at Notre Dame Cathedral in Paris in a lavish ceremony. The French court artist Francois Clouet drew Mary’s portrait several times. These two drawings, of her and her husband, are believed to have been completed by Clouet around the time of their marriage. 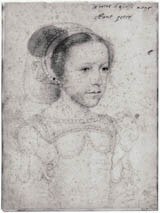 Only one year later in 1559, Mary unexpectedly found herself Queen of France as well as Scotland when the Dauphin’s father, Henri II, was killed in a jousting accident. Another year after that and Mary became a widow with Henri dying from an ear infection on 5 Dec 1560. His brother Charles becomes King Charles IX of France. Mary is now the Dowager Queen of France. However in a position of no power and childless she decides (aged 18) it’s time to return to Scotland. On the 14th August 1561 Mary set sail and 5 days later she had arrived back in Leith. A few weeks later she moved into the Palace of Holyroodhouse as Queen of Scotland. Scotland at this time was in the throes of the Reformation and a widening Protestant – Catholic split. Mary was raised as a Roman Catholic whilst in France. However whilst she was away, the official religion of Scotland had been reformed to Protestantism. On her return, she was therefore regarded with suspicion or outright hostility by many of her subjects. The Calvinist reformer John Knox preached against her as a foreign queen with an alien religion. However, not all Scots were opposed to her return. Their very tall (she was 5ft 11 inches) and very beautiful young queen returning to Scotland and creating a new court and her return was therefore welcomed by many. Mary considered several options for her next husband. In 1563, her first choice, Don Carlos, heir to the Spanish throne tragically suffered brain damage in a fall down some stairs. Many including Elizabeth I, Queen of England wanted Mary to marry a protestant to provide stability to the country. 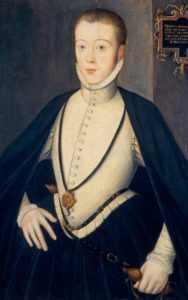 Instead Mary decided upon her first cousin Henry Stuart (Stewart) more commonly known as Lord Darnley. (Both Mary and Darnley were grandchildren of Margaret Tudor, sister of Henry VIII of England). Mary herself described him as ‘the lustiest and best proportioned man’ she had ever seen. On 29 July 1565, they married in the Chapel at the Palace of Holyroodhouse. She did not seek the required dispensation (because of her blood relationship with Darnley) from the Pope. The marriage was not a popular one and several protestant noblemen came out in open rebellion against Mary and attempted to overthrow her reign now known as the ‘Chaseabout Raids’ since direct combat never happened. It also quickly became clear that Darnley wanted more than Mary was willing to give, demanding to become King of Scots with full legal authority to rule and not just King Consort. In March 1566, Darnley was talked into taking part in a coup against Mary. A number of lords that she was going to have tried for treason influenced him. Part of this plot was the murder of Mary’s Private Secretary, David Riccio (Rizzio) on 9 March 1566. Mary is believed to have witnessed this murder. The plotters convinced Darnley that Mary had been having an affair with Rizzio and he needed to be removed. With her marriage to Darnley more or less already over, she gave birth to James on 19 June 1566 in Edinburgh Castle. Her son would of course become James VI of Scotland and James I of England. With the rumours about Riccio, Mary ensured that Darnley proclaimed James as his son, however he did not attend his baptism in Stirling Castle at the end of the year. James being christened in the Catholic faith further alarmed the Protestants that were already against her. On 9 February 1567 Mary visited Darnley, as he recuperated from illness, at Kirk O’ Field before returning to the Palace of Holyroodhouse. In the early hours of the following morning an explosion blew up the Old Provost’s Lodging House. Darnley was found dead in the garden. However not from the blast – apparently he died from asphyxiation. Many believed that Mary had full knowledge of this plan. This was because the accused murderer was one of the most influential of her advisers – James Hepburn – 4th Earl of Bothwell. The scene was being set that this was a ‘crime of passion’. By the end of February, Bothwell was widely believed to be guilty. 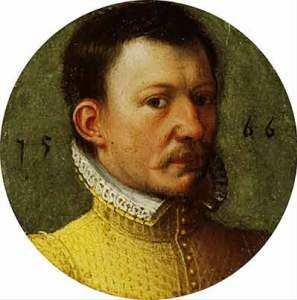 Bothwell was tried but with little evidence presented, he was acquitted after only a seven-hour trial on 12 April 1567. One week later Bothwell proposed marriage to Mary to which she declined. At this point he was already still married. A few days later, Bothwell kidnapped Mary, on her return from seeing her young son at Stirling Castle (later known to be the last time she would ever see James) . She was taken to Dunbar Castle where she was persuaded (by force some say) to marry Bothwell. 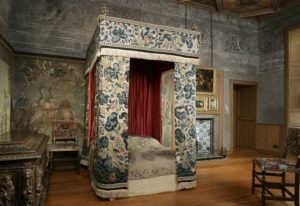 They married at Holyroodhouse on 15 May 1567 and Bothwell became Duke of Orkney. Bothwell was divorced on 3 May 1567. Protestants and Catholics were united in their revulsion of this marriage. Cataholics disavowed it due to Bothwell’s divorce and the fact it was a protestant marriage service. Both groups couldn’t believe Mary would marry the man suspected to have murdered her second husband. At Carberry Hill on 15 June 1567, Mary, Bothwell and their supporters were confronted by a dominant force of rebellious noblemen. Bothwell made his escape. Mary surrendered to the nobles and was subsequently arrested, imprisoned without trial at Lochleven Castle. On 24th July 1567 she was forced to abdicate her throne in favour of her one year old son James. Subsequently his uncle the Earl of Moray was appointed Regent of Scotland. (James Stewart, 1st Earl of Moray was the half brother of Mary and he was assassinated in Linlithgow whilst riding through the town in January 1570 – look for the plaque about this at Court Residence, High Street Linlithgow). Mary gave birth whilst imprisoned at Loch Leven. One story is that she birthed still-born twins whilst another version has her giving birth to a daughter that was smuggled to France for safety. 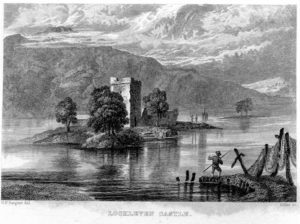 On 2 May 1568, Mary escaped from Loch Leven dressed as a servant girl with the aid of George Douglas (younger brother of William Douglas proprietor of Loch Leven Castle and half brother to the Earl of Moray). On the morning of 13 May, forces in support of Mary, Queen of Scots were marching from Hamilton towards Dumbarton Castle. They found their path blocked by troops commanded by the Regent Moray. At the Battle of Langside an estimated 300 were killed on the Queen’s side, and only a handful of fatalities in the Regent’s army. After the battle, Mary fled south to England. She spent her last night in Scotland at Dundrennan Abbey, near Kirkcudbright. She crossed into England believing that Elizabeth I would support her to regain the throne. Instead Elizabeth ordered her detention at Carlisle Castle on 18 May 1568. Two months later Mary was moved to Bolton Castle in North Yorkshire. This might have felt like she was heading further south and perhaps nearer to her goal of meeting her cousin Elizabeth I however the pair never did meet (despite some of the movies showing otherwise). Elizabeth wanted proof Mary was innocent of Darnley’s murder before agreeing to any meeting. A commission of inquiry was set up (or conference as it was known) between October 1568 and January 1569. The The sole evidence that she was party to the murder plot comes from the ‘Casket Letters’. James Douglas, 4th Earl of Morton, claimed that his servants found a silver casket in the possession of a retainer of James Hepburn, 4th Earl of Bothwell. In the casket were eight letters and twelve sonnets. The letters were written in French allegedly by Mary to Bothwell. Letter II (or the Glasgow letter was said to contain details of the murder plot and prove Mary’s complicity. Contemporaries, and historians since, have all disagreed as to their authenticity. The Conference of York (& Westminster) concludes on the 11 January 1569 that although Moray had produced insufficient evidence, Mary had also not managed to prove that the Scottish Lords had rebelled against her unjustly, and she was remanded in custody. There were several failed attempts over these years to free Mary. One of the most famous of these was The Ridolfi plot of 1571. This involved an Italian banker called Roberto Ridolfi who carried messages from Mary Queen of Scots to Pope Pius V and Philip II of Spain. This was to encourage Spanish troops to invade England and was supported by the Duke of Norfolk. Thomas Howard, 4th Duke of Norfolk would have been husband number 4 if Elizabeth had allowed this marriage. Determined to prevent more plots, Elizabeth I’s principal secretary Sir Francis Walsingham introduced the Bond of Association in 1584. This effectively made Mary responsible for any plots instigated in her name, whether or not she knew about them or approved them. Desperate to be free, Mary also proposed that she and her son James VI should rule Scotland together. However, early in 1585, Elizabeth I began a correspondence with James. Elizabeth was 51 years old; James was to turn 19 in June. Previously the two sovereigns had communicated through ambassadors but now they begin to write directly to each other. Elizabeth proposes what she terms a “league” or “contract of amity” between them as monarchs of England and Scotland. Mary was devastated when she learned of this. The final downfall came in the form of the Babington Plot. As pro catholic sentiment grew one young man Anthony Babington and six friends gathered in The Plough, an inn outside Temple Bar London. They discussed the possibility of freeing Mary, assassinating Elizabeth, and inciting a rebellion supported by an invasion from abroad. Walsingham’s double agent spies and code experts exposed this plot in August 1586. Unbeknownst to Babington, Walsingham was actually encouraging their means of communicating with Mary via coded letters smuggled inside beer barrels. This was so that he could gain evidence that Mary was aware of the plot. The letters established Mary’s complicity in the effort to depose Elizabeth. This led to Mary’s trial in October 1856. She was found guilty of treason. Mary was originally buried in Peterborough Cathedral. in 1612 her son James VI had her body exhumed. She was then placed in the vault of King Henry VII’s Chapel in Westminster Abbey. Why did Mary, Queen of Scots have a claim to the English Throne? Mary’s paternal grandmother, Margaret Tudor was Henry VIII’s older sister. Margaret married James IV of Scotland and James V was their son. Elizabeth was the only child of Henry VIII and Ann Boleyn. Henry VIII was therefore Mary’s great Uncle, and she and Elizabeth were first cousins. In 1558, Elizabeth finally became Queen of England and Ireland after her half brother Edward 1 died age 15. Lady Jane Grey succeeded the throne for only 9 days,then her half-sister Mary Tudor (Bloody Mary) died after reigning from 1553. 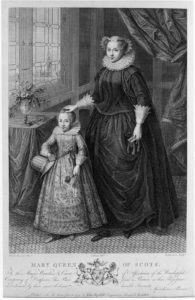 Mary’s presence represented a continued threat to the Protestant Elizabeth. Catholics believed Elizabeth the product of an unlawful marriage, and thus not a legitimate heir to the throne. Fearful that Mary would become a rallying point for England’s Catholics, Elizabeth consigned her cousin to a life of imprisonment. Elizabeth also refused to name a potential heir in her lifetime. She feared doing so would invite conspiracy to displace her with her nominated successor. With Mary now dead -the next legal heir to the throne was her son, James, who was a Protestant. James becomes James I of England and Ireland and VI of Scotland after Elizabeth’s death in 1603.